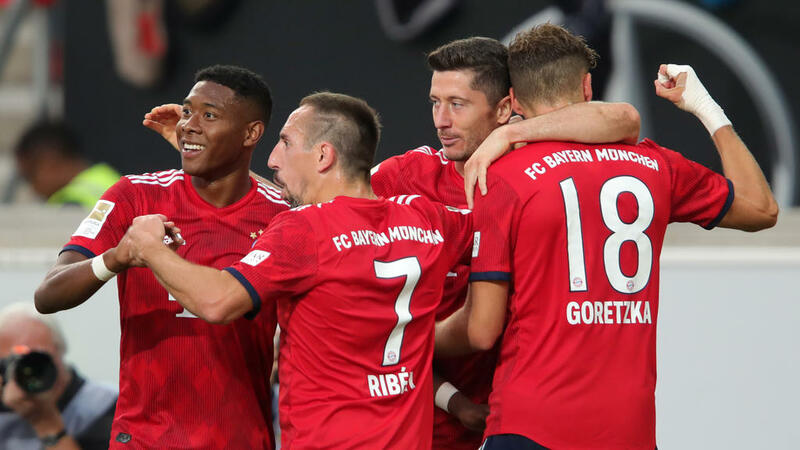 Leon Goretzka scored his first goal for Bayern Munich as the Bundesliga champions cruised to a 3-0 win over southern rivals VfB Stuttgart to go top of the table on Saturday. The Germany international who joined from Schalke 04 in July had several chances in a hard-fought first half and eventually curled the ball into the bottom corner on 37 minutes. "I feel very happy here, and the team has made me feel welcome," Goretzka told Sky. "If you feel comfortable, you can put in your best performances, and I showed that today." Bayern took control after the break, and Goretzka was involved again as Robert Lewandowski doubled Bayern's lead just after the hour mark. The Polish striker arrowed in a superb shot from the edge of the area to maintain his perfect scoring record in all competitions this season. Fifteen minutes from time, Lewandowski linked up beautifully with Thomas Mueller, who lashed in Bayern's third. "We're showing the right attitude," Mueller told Sky. "The way the front line are pressing the ball is impressive. With the amount of quality we have in the squad, everybody has to deliver." Earlier in the day, Adam Szalai scored twice as Hoffenheim came from behind to win 3-1 against Freiburg, while Bayer Leverkusen collapsed to a second defeat in their second game of the Bundesliga season. Julian Nagelsmann had criticised VAR after defeat to Bayern last week, and the Hoffenheim coach looked on furiously as the video assistant correctly denied his team an early goal against Freiburg. Nagelsmann's mood darkened further when Dominique Heintz prodded Freiburg in front on 36 minutes, but Szalai saved Hoffenheim with a brilliant second-half brace. Szalai capitalised on a defensive mix-up to draw Hoffenheim level just after the break, before turning a Nico Schulz cross into the net on 63 minutes. Andrej Kramaric sealed victory on the counter-attack in stoppage time. An abject defensive performance saw Leverkusen go down 3-1 at home to Wolfsburg, after Leon Bailey had given them the lead with a brilliant first-half strike. Leverkusen keeper Ramazan Ozcan allowed Yannick Gerhardt's equaliser to beat him at the near post on 36 minutes, and Bayer's defensive nightmare continued after half-time. An unmarked Wout Weghorst headed Wolfsburg ahead on 55 minutes, before Renato Steffen broke through the back line to seal Leverkusen's disastrous start to the season. "We travel to Bayern Munich next week, so we have to cross our fingers and grit our teeth," Ozcan told Sky. "It's a marathon, not a sprint." Milot Rashica's brilliant free-kick saw Werder Bremen steal a dramatic late win against ten-man Eintracht Frankfurt. Japanese international forward Yuya Osako's opener for Bremen was given by VAR on 22 minutes, and Frankfurt looked dead and buried when Jetro Willems was sent off before half-time. Sebastien Haller's penalty drew the home side level after the break, but Rashica broke Frankfurt hearts with a vicious, curling free-kick deep into stoppage time. Elsewhere, there were 1-1 draws between Borussia Moenchengladbach and Augsburg and Nuremberg and Mainz. Michael Gregoritsch put Augsburg ahead with a fine half-volley on 12 minutes, before Alassane Plea came off the bench to head Gladbach level in the second half. New signing Jean-Philippe Mateta headed Mainz in front midway through the first half, before Mikael Ishak drew the home side level with a net-bursting shot just after the break.